Industrial Yarn Products For V Belts And Industrial Hoses Market Key Players: Toray Group, SRF Limited, Teijin Frontier Co., Ltd, Cordenka GmbH & Co. KG, Glanzstoff, Kordsa Industries, R.D. Abbott Company, Inc., Olbo & Mehler Inc. and OC Oerlikon Management AG. Persistence Market Research (PMR), in its new report titled 'Industrial Yarn Products for V-Belts & Industrial Hoses Market: Global Industry Analysis 2013-2017 and Forecast 2018–2026', offers an eight-year analysis and forecast for the global Industrial Yarn Products for V-Belts & Industrial Hoses Market for the period between 2018 and 2026. This study analyses the global Industrial Yarn Products for V-Belts & Industrial Hoses Market dynamics and trends across seven regions. The Industrial Yarn Products for V-Belts & Industrial Hoses Market research report offers an in-depth analysis of the key trends and drivers responsible for the growth of the global Industrial Yarn Products for V-Belts & Industrial Hoses Market over the forecast period. The market has been segmented on the basis of product type and application. The Industrial Yarn Products for V-Belts & Industrial Hoses Market study covers various perspectives of the market, including value chain, forecast factors and competition landscape. The report also examines various macro-economic factors and their impact on the growth of Industrial Yarn Products for V-Belts & Industrial Hoses market. As per the findings of the Industrial Yarn Products for V-Belts & Industrial Hoses market study and perspectives of industry participants, the global Industrial Yarn Products for V-Belts & Industrial Hoses Market is estimated to grow at a CAGR of 4.4% over the forecast period. Rapid industrialization and growth in the number of manufacturing and other end use industries are expected to drive the growth of Industrial Yarn Products for V-Belts & Industrial Hoses Market over the forecast period. The Industrial Yarn Products for V-Belts & Industrial Hoses Market analysis has been presented in terms of Basis Point Share (BPS) to evaluate individual segment’s relative change in market share and respective contribution to the Industrial Yarn Products for V-Belts & Industrial Hoses Market growth. Another key detail of the Industrial Yarn Products for V-Belts & Industrial Hoses Market report is the analysis and revenue forecast of the Industrial Yarn Products for V-Belts & Industrial Hoses market in terms of absolute $ opportunity created by each and individual segment. Industrial Yarn Products for V-Belts & Industrial Hoses are special type of yarns manufactured to be used as reinforcements in v-belts, hoses, tires, airbags, etc. Industrial yarn reinforcements add stability, flexibility, strength and durability to v-belts and hoses and thus, increase the life span and efficiency of final products. Given the wide applications of industrial hoses and v-belts across a number of manufacturing industries, Industrial Yarn Products for V-Belts & Industrial Hoses are expected to register significant demand in the coming years. The global Industrial Yarn Products for V-Belts & Industrial Hoses market is estimated to grow at a CAGR of 4.4%, reaching a market value of US$ 4.8 Bn by the end of projected period. Growth in various end-use industries and growing applications are the two factors expected to create significant growth opportunities in the Industrial Yarn Products for V-Belts & Industrial Hoses market during the forecast period. By product type, the dipped single end cords segment is expected to lead in terms of value and volume in the global Industrial Yarn Products for V-Belts & Industrial Hoses market. 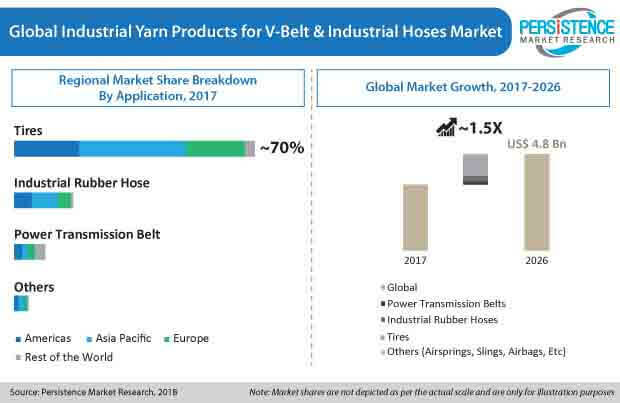 The segment is estimated to have accounted for approximately 83.2% share in the Industrial Yarn Products for V-Belts & Industrial Hoses market by the end of 2018 while the braiding yarns segment is projected to grow at a value CAGR of 4.3% during the forecast period. The demand for dipped single end cords in the Industrial Yarn Products for V-Belts & Industrial Hoses market is expected to be driven by the growing automotive and tire industries. On the basis of application, the tires segment is expected to create very high demand in the Industrial Yarn Products for V-Belts & Industrial Hoses market. Production of tires is directly proportional to volume consumption of reinforcements. Thus, increasing production of tires will propel the growth of Industrial Yarn Products for V-Belts & Industrial Hoses during the forecast period. From a regional standpoint, China is poised to be a prominent region in the Industrial Yarn Products for V-Belts & Industrial Hoses market, in terms of market share. Growing end-use industries in the region are expected to drive the demand for Industrial Yarn Products for V-Belts & Industrial Hoses. India and Middle East & Africa are projected to register notably high CAGR in the Industrial Yarn Products for V-Belts & Industrial Hoses market during the forecast period. Industrialization is one of the key driving factors for the growth of Industrial Yarn Products for V-Belts & Industrial Hoses market. Industrialization has been growing at a rapid pace across developing economies, such as China and India, due to the growing population and growing consumer needs. Growing use of industrial yarn products for v-belts & industrial hoses in end-use industries and growth in manufacturing sector are two important factors expected to contribute towards the growth of Industrial Yarn Products for V-Belts & Industrial Hoses market. The global Industrial Yarn Products for V-Belts & Industrial Hoses market is a highly fragmented market. The presence of numerous domestic as well as global market leaders in the Industrial Yarn Products for V-Belts & Industrial Hoses market has led to the creation of a very competitive environment for the manufacturers. The tier-I players account for approximately 25%-35% of the Industrial Yarn Products for V-Belts & Industrial Hoses market, while the remaining players account for 65%-75% of the total market share. Few of the key global market leaders in the Industrial Yarn Products for V-Belts & Industrial Hoses market are Toray Group, SRF Limited, Teijin Frontier Co., Ltd, Cordenka GmbH & Co. KG, Glanzstoff, Kordsa Industries, R.D. Abbott Company, Inc., Olbo & Mehler Inc. and OC Oerlikon Management AG., among others. How is the Industrial Yarn Products for V-Belts & Industrial Hoses market expected to grow over the projected period? What direction is the Industrial Yarn Products for V-Belts & Industrial Hoses market expected to take in terms of volume and value during the forecast period? What are the key macro-economic factors affecting the growth of the Industrial Yarn Products for V-Belts & Industrial Hoses market? What are the key market drivers in the Industrial Yarn Products for V-Belts & Industrial Hoses market? What are the key opportunities and improvement areas for Industrial Yarn Products for V-Belts & Industrial Hoses market players? What are the predominant developments and trends taking over the Industrial Yarn Products for V-Belts & Industrial Hoses market? Which countries are expected to create significant growth opportunities in the Industrial Yarn Products for V-Belts & Industrial Hoses market?